TGIF! Is anyone else excited for the weekend? I know Lacey and I are! Weekends mean Daddy is home to play Lacey’s favorite games. Pop over and find out which are THE best dog toys according to Lacey! Lambchop is Lacey’s favorite indoor toy. She makes sure Lambchop comes along when we go to the lake. As soon as we put the suitcases in the car, Lacey runs inside and grabs Lambchop. It’s as though Lacey is saying “I’m packed, too!” So, we end up taking this enormous stuffed toy along with us each time. So cute. Lacey’s favorite outdoor game is playing fetch with a tennis ball. But since I can’t throw very far, I bought an awesome ball thrower at the grocery store years ago. It was about $20 but worth every penny! The ball thrower is made of heavy duty plastic and has a hinge in the middle so you can fold it in half for easy storage and it holds two balls. It extends to 29 inches which is nice because you don’t have to bend over to pick up the ball either. You just pick up the ball with the claw and sling it. And it goes really far! Trust me, this is a great toy. Recently I looked at the grocery store for another one because I wanted to leave one at the lake house. Sadly, the grocery store didn’t carry them anymore. The name of the company that makes the product wasn’t on the toy so I didn’t know how to find it. The only ball thrower that came up when I googled it was “Chuckit”. No offense to Chuckit, but it doesn’t work as well as the one we have. When I throw the ball with the Chuckit, the ball slams straight down instead of out. After searching on the internet I finally found the name of our favorite ball thrower. I ordered one and got it in the mail. It was called “Powzer Dual Ball Thrower”. But when I tried to search again for the website, it wouldn’t come up. Did the company go out of business? I don’t know, but if you want one too, you can find one on eBay under “Zoink Fetch ‘n Fling Ball Thrower” for as low as $13.17 plus free shipping. Lacey’s other favorite toy is a frisbee. (This is the “F” word in our house because if you say the word “frisbee” Lacey goes nuts.) Again through trial and error we found the perfect frisbee. The classic hard plastic frisbee was too hard on her mouth and it was hard for her to pick up if was upside down. 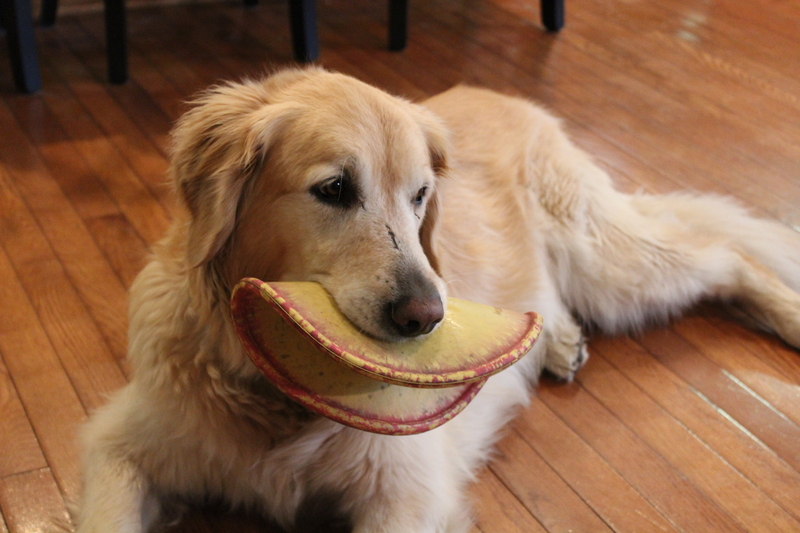 This frisbee by Ruff Dawg is soft and pliable. This allows Lacey to catch the frisbee AND pick it up. She scratches it with her paw and picks it up in her mouth like a taco. Lacey has several frisbees as you can see. The down side of the Ruff Dawg frisbee is it doesn’t float. So, if you accidentally throw it in the lake, it’s a goner. However, Lacey likes to drop it in the pool on purpose then barks until someone gets it for her. It’s Lacey’s version of fetch. The upside? This frisbee is made in the USA! Our local pet store carries this frisbee or you can order it online at Chewy.com and search for Ruff Dawg frisbee. They are around $8.99. Two frisbees are better than one. Happy Hill-You had me at Hello!